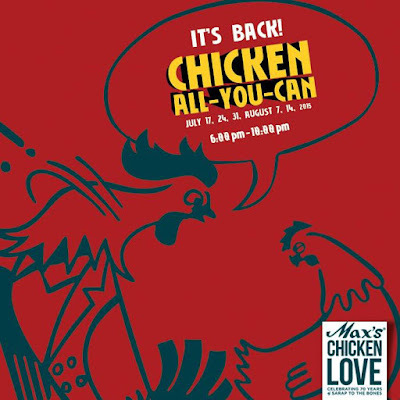 Celebrating it's 65 years in the food industry, Max's Restaurant brings back it's much awaited annual event: Chicken-All-You-Can!! Every FRIDAY starting July 17, 6pm to 10pm for P229! Get ready for some unlimited #ChickenLove! • Not available for takeout, delivery, bulk order and functions. • Valid in all Max’s branches in the Philippines only. Per DTI-FTEB SPD Permit Number 8062 Series of 2015.